Crafting is incredibly popular in the U.S. these days. A quick Pinterest search will reveal suggestions on how to make anything and everything at home, ranging from extremely useful projects like DIY chair reupholstering to less useful (but still fun) crafts like DIY burlap wreaths. But as any Pinterest maven knows, some projects are simply better left undone. An Erie County Sheriff's deputy pulled over a woman in New York on Wednesday when he noticed he license plate just didn't look right. Upon closer inspection, the officer discovered the "license plate" was actually just a phony crafted from cardboard and paint. Though one may assume police admired her effort and creative vision, the driver, Amanda Schweickert, 28, was still arrested and charged with possessing a forged instrument, which is a felony offense. Due to some other issues and violations -- Schwieckert was driving a car with a suspended registration and without insurance -- she was charged with one felony count of possessing a forged instrument, one misdemeanor count of operating a vehicle with a suspended registration and three vehicle and traffic infractions. As of Thursday afternoon, Schweickert was being held at the Erie County Holding Center, with bail set at $400. 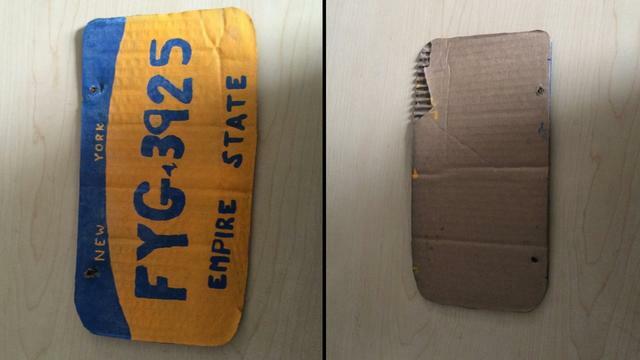 The Erie County Sheriff's Department, not without a sense of humor, used the incident as an opportunity to remind people on Facebook of a lesson that shouldn't bear repeating: "homemade cardboard license plates are NOT legal."